The Truth About Knitting and Crochet….They are Good for You! So says Clara Parkes, author of the just-released book The Yarn Whisperer: Reflections of a Life in Knitting (STC Craft/A Melanie Falick Book) and the founder and publisher of KnittersReview.com. Personal testimonies, anecdotal evidence, and medical studies all back up Clara Parkes’ claims. Magee, though, has a secret weapon in her health arsenal: Knitting needles. Magee is not alone in her assessment of the craft’s palliative affects on the mind. Knitting has been called the “new yoga” for good reason. Famous for its relaxing, meditative qualities, knitting increasingly is being used in hospitals, clinics, schools and even prisons to help people lead healthier, happier lives. And there’s data to prove it. “Knitting saved my life,” says Liat Gat, who runs the video instruction site KNITFreedom.com. Admitted to a clinic in her 20’s with a full-blown eating disorder, Gat, a lapsed knitter, started stitching again when the facility’s craft volunteer came around with yarn and needles. Soon, she had countless projects going and was helping other women fix their mistakes. And within weeks she was out of the clinic and working at a yarn shop. Gat’s experience of knitting her way out of an eating disorder has scholarly precedent. A 2009 study published in the journal Eating and Weight Disorders showed that when 38 women with anorexia nervosa were taught to knit and given free access to knitting supplies, they reported significant improvements. 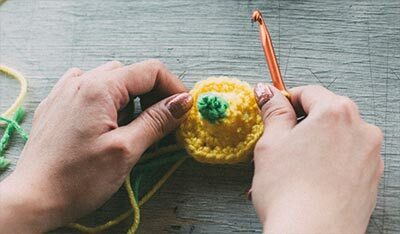 An impressive 74 percent said knitting lessened their fears and kept them from ruminating about their eating disorders; 74 percent lauded the calming aspects of the craft and 53 percent said it provided satisfaction and a sense of accomplishment. Magee, who along with her husband owns Airship Printing, a screen-printing business in Castle Rock, Colorado, has created a line of goods under the brand Knerd Shop (knerdshop.com) that includes a t-shirt, bag and stickers that read, “I knit so I don’t kill people.” Though the sentiment is amusing, it carries an element of truth: Knitters ascribe all manner of benefits to their craft that include everything from alleviating depression, anxiety and pain to reducing boredom and the discomfiting affects of isolation. Meredith Keeton, 32, knits to combat the loneliness she experiences when forced to stay home because of her rheumatoid arthritis. In ensuing years, Caparosa felt a need to give back. Her daughter was thriving, so she returned to the pediatric intensive care unit at MedStar Georgetown University Hospital where her daughter had been a patient, volunteering to teach parents and older children to knit. Her teaching gained a following and she expanded her work to the hospital’s Neonatal Intensive Care Unit and incorporated her program as the nonprofit, Project Knitwell. In 2010, two Georgetown oncology nurses—stressed out by their jobs and graduate school—decided to use Project Knitwell for their thesis research. Personally aware of the incredible strain and loss oncology nurses experience, Lyndsay Anderson and Christina Urso wondered whether knitting might mitigate some of the burnout—or “compassion fatigue”—these nurses experienced. The grad students administered a survey to the nurses that measured burnout at two junctures: before learning to knit and 13 weeks later, after they had learned and been working with Project Knitwell volunteers. “Anecdotally we knew everyone on the unit was suffering,” Anderson says. “Nobody was doing fine.” Indeed all 39 nurses who participated showed some degree of compassion fatigue in the “before” test. Each nurse was taught to cast-on and knit. In addition, Project Knitwell volunteers appeared regularly on the oncology units to fix mistakes and assist them in choosing new projects should they want to progress. Knit kits were also stashed on the oncology floors, so nurses could knit spontaneously. The results were significant. Everyone’s burnout scores improved, especially the nurses who were the most burned out prior to the study. In answers to open-ended questions, nurses extolled the soothing rhythm of knitting and distraction from work-related fatigue. Though the sample was small, it was enough to convince hospital administrators to add Project Knitwell to its staff enrichment programs as well as provide sessions to graduating nurses. Common wisdom has it that brain games like crossword puzzles and sudoku may help keep the brain sharp over time. But what about two sharp sticks and some yarn? Yonas Geda, associate professor of Neurology and Psychiatry at the Mayo Clinic in Arizona, published a study in the Spring 2011 edition of The Journal of Neuropsychiatry & Clinical Neurosciences that validated crafters of all stripes. His research showed that people who engaged their minds by reading books, playing games or crafting had a decreased risk of mild cognitive impairment, a possible precursor to Alzheimer’s Disease and other forms of dementia. Their study looked at 1,321 adults, ages 70 to 89, 197 of whom had been identified as already having mild cognitive impairment. Both the normal and cognitively impaired groups were surveyed about their activities within the last year. The study demonstrated that using the brain might prevent losing it. The data showed that computer use, playing games, crafting, reading books and watching less TV resulted in a striking 30 to 50 percent decrease in the odds of having mild cognitive impairment. Though the study didn’t examine exactly how these activities might protect the brain, it did reference other works suggesting that mentally active people overall might live healthier lifestyles, maybe exercising and eating better, or that cognitive activity might promote the development of new neuro pathways—or cognitive reserves. In other words, staying mentally active through knitting and reading, etc. makes “deposits” to an individual’s brain “bank”; this can possibly buffer against Alzheimer’s Disease and other forms of dementia. There are a lot of theories about why knitting is good for the brain. Once a knitter has mastered the movements, the process is rhythmic and repetitive. According to the Benson-Henry Institute for Mind-Body Medicine at Massachusetts General Hospital, knitting’s repetitious movements theoretically can elicit the famous relaxation response, which is the body’s counterbalance to stress, a state in which heart rate and blood pressure fall, breathing slows and levels of stress hormones drop. Knitting also involves following and recognizing patterns, learning new stitches and using both hands and math, lending it the capacity to improve fine motor skills while also keeping the mind active and engaged. The Waldorf Schools, for example, teach children to knit before teaching them to read in the belief that knitting develops dexterity, focus and rudimentary arithmetic. The social aspect of knitting, too, plays into knitting’s positive mental benefits. For people who like to knit in groups, knitting provides a social outlet, a critical element in maintaining mental health. And it allows for self-expression, charity and that sense of feeling productive. 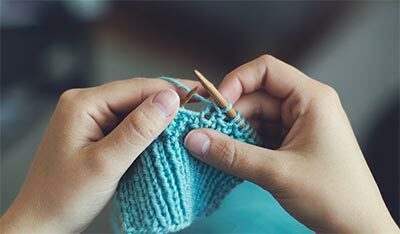 Some of the most interesting work on the health benefits of knitting is being done in England, where Betsan Corkhill, a former physiotherapist with the National Health Service (NHS), is conducting research and aggregating data on knitting for health. Today, as a result of her work, which she presented at an Annual Scientific Meeting of the British Pain Society, more pain clinics in the U.K. are using knitting therapeutically. In 2010, Corkhill in conjunction with an occupational therapy lecturer from Cardiff University, conducted an online survey of the Stitchlinks.com community (Corkhill’s website and clearinghouse of information about the therapeutic benefits of knitting). In the survey, they asked people why they stitched and about knitting’s perceived effects on mood, feelings, thinking, social activity and skills. Within two weeks, they received a staggering 3,545 responses. The study, which was published in the February 2013 issue of the British Journal of Occupational Therapy, revealed that the majority of knitters (here mostly white, female and avidly knitting) reported a significant relationship between knitting frequency and feeling calm and happy. Respondents, who knit the most often, said that knitting positively affected their cognitive functioning, helping them to sort through problems or think more easily. Most promisingly, Exeter University just funded PhD candidate Mirja Rutger and her main supervisor Professor Paul Dieppe to study knitting groups with Corkhill serving in an advisory capacity. The initial part of the study will work to tease out what actually is happening when people knit together—and how to measure it. Knitting is being used all over the world to help people knit themselves into better places. Yarn Alive is a knitting group in Shichigahama, Japan that has knit together since the earthquake and tsunami in 2011. The members all lost their homes to the disaster. Knitting Behind Bars teaches prisoners to knit in the Pre-Release Unit in Jessup, Maryland. The inmates knit for charity. Project Knitwell provides knitting lessons to people undergoing stressful situations. Volunteers currently teach in hospital settings in the Washington, D.C. area. Wounded Warrior Knitting Wednesdays on Ravelry.com gives knitting lessons to family members, wounded warriors and staff in the lobby of the Walter Reed National Military Medical Center. Knitamorphosis Karen Zila Hayes, a Toronto life coach, offers knitting therapy programs as part of her practice in Toronto, Ontario, including Knit to Quit (a smoking cessation intervention), Knit to Heal (for individuals and families dealing with health crises) and corporate wellness for stressed-out workers.